A series of mystery thrillers set in and just before the 1840s, a decade of turbulent social and technological change. Anarchic Georgian attitudes gave way to rigid prim Victorian ones; horse and carriage to railway and telegraph, and criminal investigation and the British police force were in their infancy. The stories centre on Jeremiah Blake, a brilliant, taciturn special inquiry agent – the prototype of the private eye – with a talent for finding things, and his relationship with William Avery, a young provincial gentleman-soldier. Theirs is an awkward relationship not fully sanctioned by Victorian society – the older dominant working-class man leads the younger posher subordinate officer – and they often rub each other the wrong way. Despite this, each gives the other something he needs and together they penetrate Victorian society from aristocratic peak to grim underbelly. Jeremiah Blake has a misanthropic, wary shell which hides gentler feelings and voracious intellectual curiosity. He is a brilliant linguist, a self-taught intellectual, with an instinctive understanding of people’s motivations. He also has a set of less salubrious skills that date back to his criminal past. Transported to India as a child by the East India Company and taken up by poet, adventurer and spy Xavier Mountstuart, he was trained for spying missions. As a young man he gained swift promotion. However, he rebelled against the Company's self-serving policies, earning demotion and disgrace. The youngest son of West Country gentry, William Avery is handsome, good with a gun, occasionally stupidly brave, and has few prospects. He is also the product of his rural Tory upbringing and starts out as the voice of middle-class Victorian England: the workhouse discourages laziness in the poor, democracy is dangerous, and the British have a God-given right to dominate less advanced races. But he has a less straightforward side, born of a difficult childhood, a secret passion for books and poetry, and an instinct to take care of others. Four years in India leave him a much-decorated hero, but also traumatized and uncertain of what he wants. 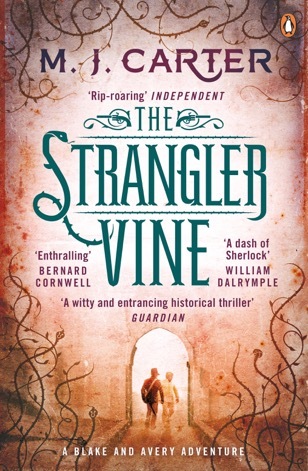 The two men meet in The Strangler Vine. Blake is living in the native part of Calcutta, doing occasional jobs for the Company, one of which brings him and Avery together. Though neither quite understand why each is drawn to the other. Avery brings out Blake’s reluctant humanity, while Blake shows Avery the darker side Victorian society and challenges his most deeply held assumptions. 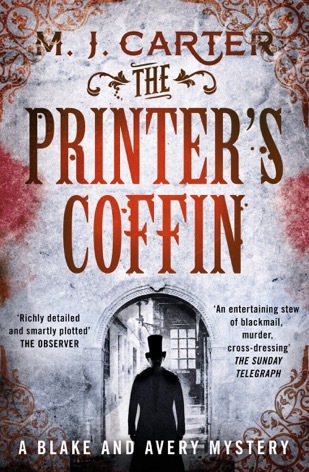 In the second book, The Printer’s Coffin, the two meet in London after three years apart and have to start their relationship all over again. Avery has been thinking about Blake all this time and feels a deep sense of connection with and obligation to him, but Blake has withdrawn back into his shell and is determined not to admit that he needs anyone. He finds himself at odds with Victorian society and is increasingly angered by its inequalities, iniquities, cruelties. Where this anger will lead is anyone’s guess. Avery is still a natural conservative and still fascinated by the older man, but he has been traumatized by the experience of war, his marriage is wobbly and these have stripped him of some of his innocence and naivety. In the third book, The Devil’s Feast, London takes centre stage again, with the duo painfully learning to rub along with each other, neither quite understanding why, given their different social standing and attitudes they are drawn to each other. I think Avery forces out Blake’s reluctant humanity, while Blake forces Avery to grow up and see the ugly contradictions in the world about him.